WordPress speed issues can be incredibly frustrating. Even an extra second or two can mean lost visitors, or worse – lost business. There’s a lot of speed-boosting advice out there, but it can be hard to know what is really going to work for your site. If you’ve tried a few methods, you know they’re not always effective or reliable. You don’t have time to waste on that kind of hit-or-miss approach. You need methods that work. We’ve brought together a list of the top techniques to optimize your WordPress website. This list focuses on tips that you can apply immediately. You can start seeing better results in no time at all. To get the best speeds, you need a WordPress-optimized hosting service that offers both fast server speeds and SSD storage. You’ll also want to look for hosts that give you at least PHP 7.2, such as A2 Hosting or SiteGround — because if you’re still running on PHP 5.2, your website is likely to be 400% slower. If you can find a host with LiteSpeed Web Server or NGINX, even better, as either of these two will speed up your servers considerably. Liquid Web offers some great-value plans with NGINX, for example. Hosting your WordPress website on a shared server is the cheapest route. But because you’re sharing the server with hundreds of other websites, at busy times your page loading speeds will be affected. In many cases, shared hosting isn’t going to meet your needs. Cloud hosting is a much faster alternative to shared hosting, simply because it gives you access to a far greater level of resources (bandwidth and CPU power, for example). Essentially, cloud hosting taps on servers all around the world to provide guaranteed resources when you need them. Many hosting providers are now using cloud hosting for their managed WordPress plans. Managed WordPress hosting using cloud servers is the best way to ensure that you get the performance you need. To learn more about managed WordPress hosting, check out our in-depth article. Your WordPress theme can have an enormous impact on how fast your website is, so there’s a lot more to the decision process than just picking one that looks good. A few examples of themes that are both lightweight yet offer advanced functionality include SEO WP, Braxton, Taskerr, Schema, and Best. These all score very well on both Pingdom and Google PageSpeed Insights. You should also ensure that the theme you chose isn’t vulnerable to hackers. To do this, make sure you’re getting your WordPress theme from a reliable source (WordPress.org or Template Monster, for instance), then check that the theme is regularly updated and other users haven’t encountered any security issues with it. Many of the hosts we mentioned above include proprietary caching plugins with their plans, but if your host doesn’t, there are plenty of effective alternatives. A caching plugin can dramatically improve your page loading speeds – by up to five times, in fact. Here’s how caching plugins work. The first time a page is loaded, the plugin copies the page, so the next time anyone goes to that page, the cached version is shown. This gives the server a bit of a break from generating pages, and means that your website won’t slow down if a lot of people are visiting your website at the same time. WP Rocket is one of the best caching plugins available – and it’s beginner-friendly, too. With a single click, you can cache your website instantly. This fully-featured plugin also automatically turns on all the settings you need for the most effective caching, such as GZIP compression, page caching, and cache pre-loading. An alternative to WP Rocket is W3 Total Cache. This plugin has tons of features including page caching, object caching, GZIP compression, minification support, and CDN support. With so many settings and options, it’s less beginner-friendly than WP Rocket – but great if you want more control over the settings. Images can reduce your bounce rate and increase your conversion rate, which is great for your business. There is, however, an unfortunate problem with images: they can slow your website down. As smartphones get more advanced, they come with cameras with increasingly higher megapixels — and more megapixels means bigger file sizes. Before you upload photos to your WordPress website, you need to reduce the file sizes of those photos. Ideally, you want a full-page image to be no larger than 80-100KB in size. If you’d rather not have to use photo editing software, there are plugins that can do this for you. You can configure the level of compression and let the plugin reduce your file sizes automatically. It’s a quick way of optimizing images on the fly. One of the best image optimization plugins available is the EWWW Image Optimizer. It’s super easy to use and offers a range of advanced features. For instance, you can even optimize images stored outside of your media library, or optimize images in batches through the bulk optimization feature. You won’t need to sign up for an account to get an API key, either. Smush is another image optimization plugin, but this one has both free and premium versions. It gives you a range of options to reduce your image file sizes, including automatic compression during uploading and the compression of your existing media library. With the premium version, you can optimize up to 50 images at once. The only drawback to using an image optimization plugin over photo editing software is that adding more plugins to your WordPress installation can affect performance (see #9). Despite this downside, the speed improvements gained through compressing images is greater than the loss of speed through plugins – and many of the plugins are optimized to minimize their impact, too. Many professional bloggers have begun to use CDNs to improve their page loading times. Essentially, a CDN ensures that all the static files on your website – including CSS, JS and images – are delivered rapidly to your visitors using servers located as close to them as possible. If you have a lot of rich media on your website, this can make a huge difference to your loading speeds. Cloudflare is one of the most popular CDNs in the market, and the great thing about it is that you can sign up and use it for free. The free plan is rather limited, but Cloudflare’s paid plans are affordable even on a budget. Cloudflare customers have reported that their website loading times have decreased by 50%. Some web hosts, like Flywheel, include their own CDNs with their hosting plans. It’s well known that JS and CSS files can greatly impact the performance of your website. Both the size of the files and the number of JS and CSS calls for each page can slow down your page loading speeds. The good news is that you can easily minify these files. You can also install a plugin, such as Autoptimize, to do it for you. Autoptimize is the best plugin if you want a simple setup that you can leave running in the background. All you have to do is check a few boxes to start the optimization process. Fast Velocity Minify has more settings to choose from, meaning it’s a little less user-friendly than Autoptimize. However, you can choose to exclude certain files from being minified and change other aspects of the minification process, such as not merging Google Fonts. Fast Velocity Minify is ideal if you want more control over what is (and isn’t) minified. Plugins can handle the GZIP compression process, so you don’t need to manually mess with your .htaccess file. WP Performance Score Booster is a solid choice for GZIP compression and comes with a host of other features, including removing query strings from CSS and JS files. After using it, you can check out the difference in your website’s speed using Pingdom. Some hosting providers, such as WP Engine, will enable GZIP compression for you, particularly if you’re on a managed WordPress hosting plan. Be sure to check with support before editing the .htaccess file on your own. WordPress plugins are way too easy to hoard. You probably have plugins that you’ve installed, but you never actually use them. They sit there on your website, taking up space and cluttering the server like a plugin junkyard. You need to be careful about duplicate plugins and plugins that don’t really achieve much (or anything) for your website. Take a look at your plugin list and do an honest inventory. Are there any plugins that you’ve never used or that serve no purpose on your website? Are there plugins that do the same function as another? Deactivate — or, even better — uninstall them to improve your website’s performance. If your website has been live for a while, it’s quite likely that your database has become bloated. Plus, when you delete plugins, there are often settings and data left behind. This can impact your website’s performance, so cleaning out all this old data can speed things up. You can do a manual cleanup of your database, but plugins such as WP-Optimize can do it for you. These also offer you the ability to schedule database optimizations on a regular basis to keep your website performing well. One of the biggest culprits for slow loading speeds are your page and post revisions. Every time you edit a page or post, WordPress saves each revision — but it’s likely that you really don’t need all those old revisions! Plugins such as WP-Sweep make it easy to delete these old revisions, but be sure to make a backup before you start. You might also want to consider limiting the number of revisions WordPress makes – or even disabling the revisions function entirely. To limit the number of revisions stored or to disable revisions, you’ll need to edit the wp-config file. You can access this through your hosting control panel or via FTP. AMP (Accelerated Mobile Pages) is a recent development in the world of SEO. Not only does it make your pages load almost instantly on mobile devices, but it also improves your Google search rankings. AMP is completely CSS-based, which is one of the reasons that it’s so fast. Another feature of AMP is that it effectively forces you to streamline your website and avoid using inline CSS and animations that tend to slow down your website. AMP by Automattic is a plugin developed by the company behind WordPress itself. It makes using AMP a simple process: install, activate, and you’re done. Alternatively, for more customization options, you could use AMP for WP – Accelerated Mobile Pages. This plugin allows you to add custom code, set up Google Analytics, and much more. Click here to read more homepage best practices. If your website is home to large downloadable files like videos, games, audio, and PDFs, this can have a huge impact on your whole site. Ideally, you want to offload these files from your own hosting space to dedicated media hosting services. Two popular media offloading services include Amazon S3 and Google Cloud Storage. 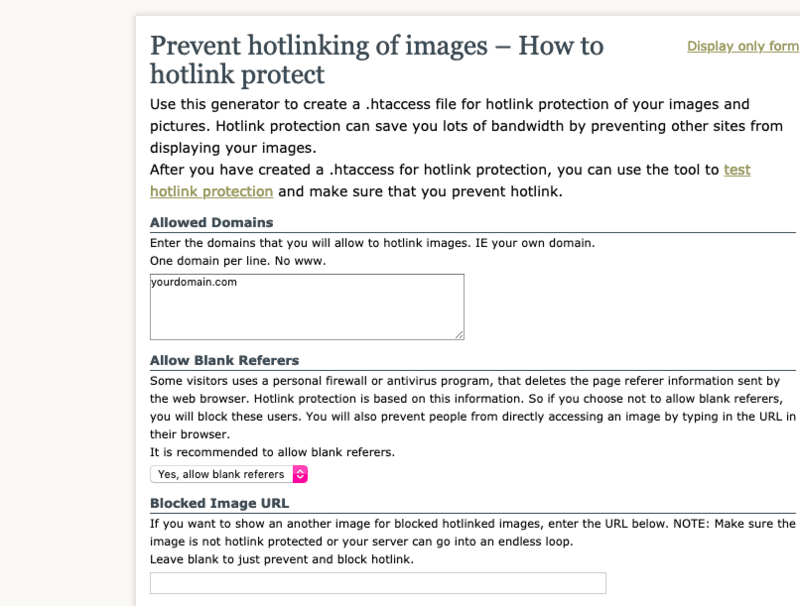 Hotlinking is when other people link to your files from their own websites. Not only does it steal bandwidth from you, but it also increases the burden on your server. If you have infographics, for example, you may find that a lot of websites are directly linking to the image files and slowing down your website as a result. It’s a simple enough process to prevent hotlinking – you just have to insert a piece of code into your root .htaccess file. If you’ve done all you can to speed up your website but are still experiencing performance issues, there are tools you can use to find the source of the problem. For instance, performance monitoring software such as New Relic enable you to identify slow plugins and problems with database optimization. The Query Monitor plugin is also an excellent choice for discovering and resolving performance issues. These are just a few of the more immediately actionable ways in which you can improve the speed of your WordPress website. It’s also a good idea to regularly monitor the performance of your website – and we have a helpful list of the 7 Best Website Monitor Plugins and Tools for WordPress to get you started. If it’s time for a new web host, check out our list of the Best Managed WordPress Hosting providers.